One good friend of a gardener is the cornus, dogwood, also known as the red or flowering dogwood. 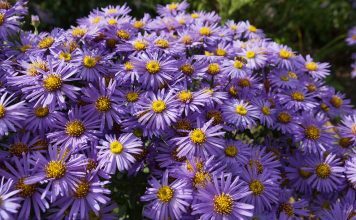 It usually exists in every garden and looks good in parks or around waysides, as well. A delight to the eyes are its leaves until late autumn, its beautiful inflorescences in spring and its brightly colored bark in winter. 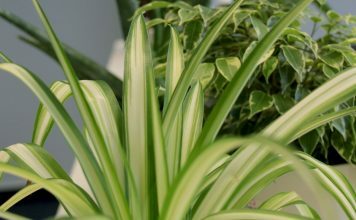 With perfect care and location, it is an undemanding plant which requires little effort and grows best when it is planted solitary. The young shoots of dogwoods are blood-red, which explains this shrub’s name. Known as red dogwood it is widely spread in Central Europe. It is more said to be an ornamental shrub rather than a fruit tree, even though its fruits are edible. They are similar to cherries and furthermore the bitter cornelian cherry belongs to the family of dogwoods. 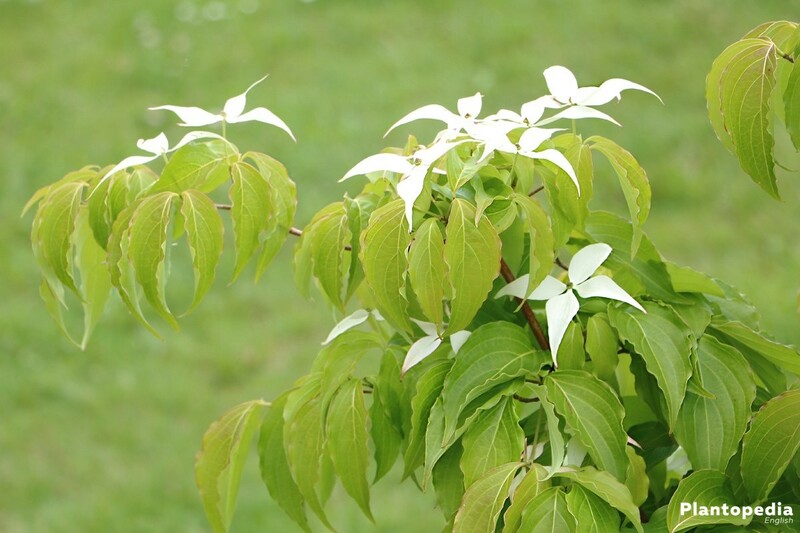 The most important thing when planting a dogwood is the proper location; besides that, a gardener will be pleased by its durability and beautiful flowerage in spring. We provide detailed clues on a proper cultivation and propagation. Around the world there are more than 50 different species of dogwoods. The dogwood occurs both in wild forms and in breeds. The most common in Middle Europe are the red dogwood (cornus sanguinea) and the cornel cherry (cornus mas). These are usually solitary plants, which prefer to stand alone. 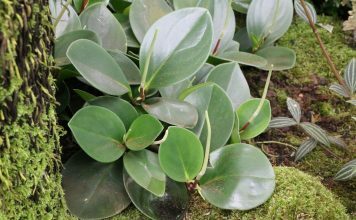 The shrub is often planted in front gardens, courtyards or parks. 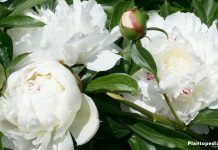 It is also perfect in front of hedges or bigger trees and shrubberies. It accentuates especially in front of somewhat darker backgrounds. When planted near hedges, the dogwood is sometimes considered a pioneer plant. In autumn and winter birds feed from the bright red fruits of the vitamin C-bearing cornelian cherries. 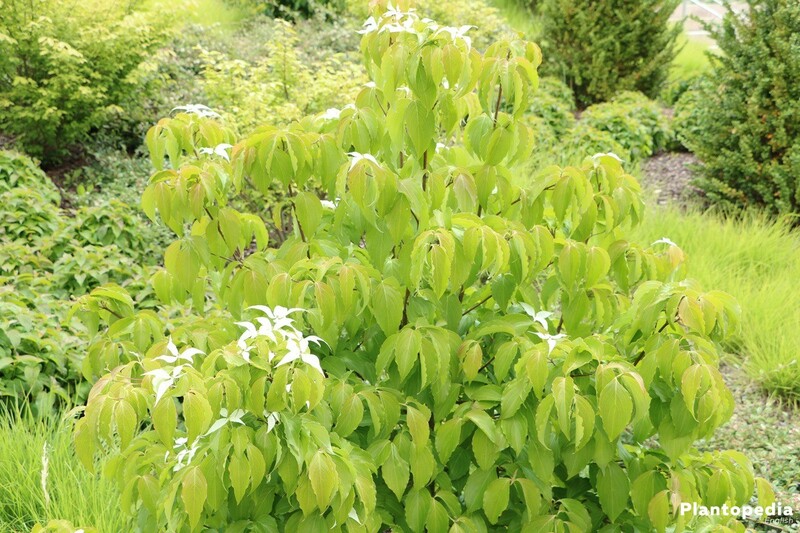 Yellow twig dogwood (cornus sericea ‘Flaviramea’) Subgenus mesomora raff in two species with dark blue fruits – A popular ornamental shrub in the garden. A hint is the planting of Cornus kousa ‚Teutonia‘ whose berry fruits can be harvested and preserved in autumn. Teutonia is a plant from the genus of the Japanese dogwood which comes into striking white flowers between May and June. Once you have decided on a type, you should pay attention on the ideal location and soil condition, so the dogwood grows well and produces pretty blossoms and fruits. Its popularity is also due to the beautiful leaf colors in autumn. 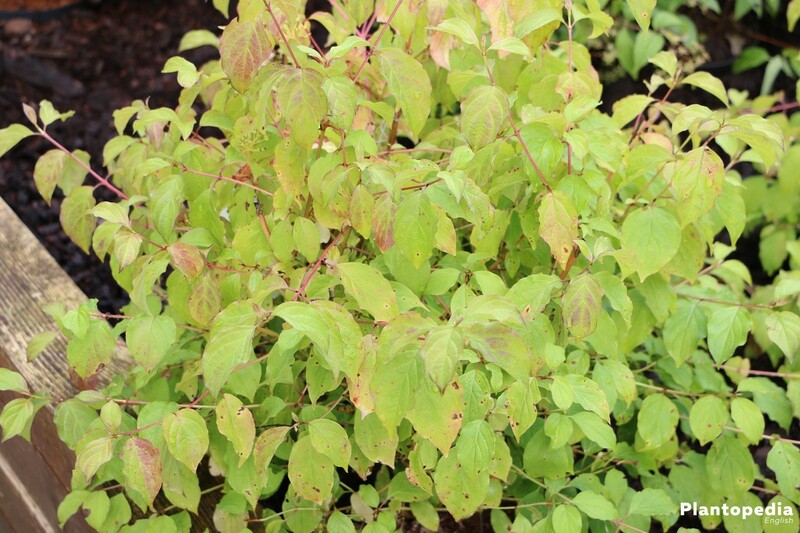 This ornamental shrub makes itself ideal as a solitary plant in hedges, flowerbeds or free standing in the lawn. It harmonizes with conifers or woody plants like the dog rose, marsh, privet, rhododendron or the wayfaring tree. It also forms a decorative plant community with lush flowering perennials such as lupins, larkspurs, daylilies or sunflowers. The location should be chosen with care, since this ornamental shrug grows slowly and needs optimal conditions to assert itself. A light, not too sunny place is to be preferred, most suitably with half-shade or dynamic shadows. The soil has to be rich in humus and of a slightly acidic to neutral character. At the same time the soil must not be too heavy and it is supposed to have a high permeability. Otherwise, mix it with sand, but pay attention to a high nutrient density. The soil may not be too calcareous. Dogwoods love a harmonious, balanced soil climate. They are grateful when the soil is added mature compost. Always keep in mind that the soil should remain quite loose and not condensed. However, domestic species like the red dogwood or the cornel cherry are better adapted to loamy, moist garden soil with a high content of nutrients and lime. 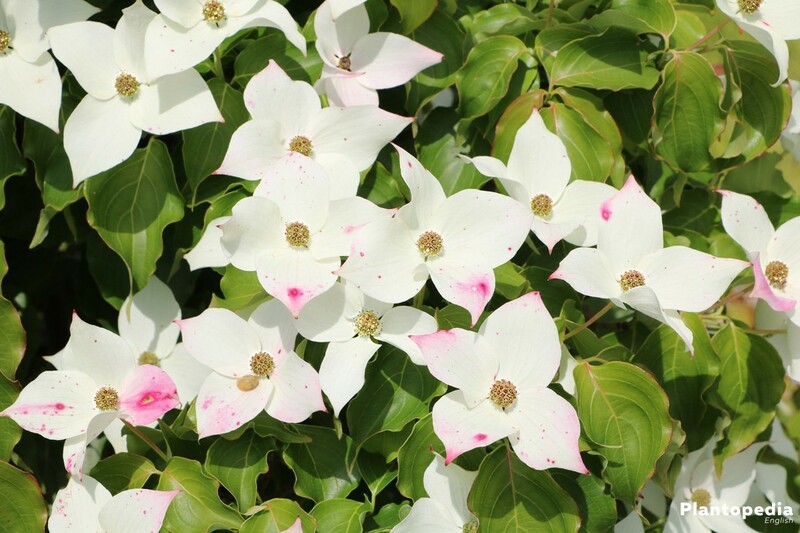 The exotic dogwoods, on the other hand, prefer a sandy and dry soil. The flowering dogwood neither likes lasting dryness, nor dammed-up water. Therefore, it should be assisted by watering during dry heat waves. Pay attention to soft water with little lime. It is best to use water from the rain barrel when it is too hot. The best thing is to mulch the dogwood with bark or grass to keep the soil moist and loose. 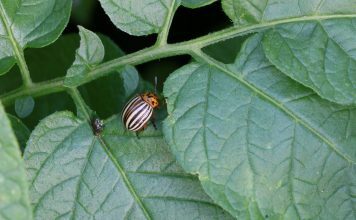 At the same time, this provides the shrub with nutrients. 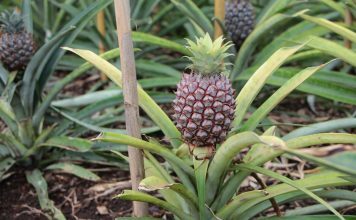 For fertilizing, it is sufficient to use mature compost from time to time which is carefully added to the soil with a garden claw. 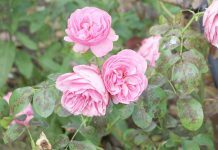 Mature dung or high-quality finished fertilizer can be used before flowering as well. It should be noted, however, that the dogwood is sensitive to excessive nutrient admixtures, less is more. A gardener with a ‘green thumb’ will recognize from the blossoms and leaf, whether the dogwood needs more or less fertilizer. A flowering dogwood should always be potted in spring, so the roots can grow well during summer and cope with the winter. 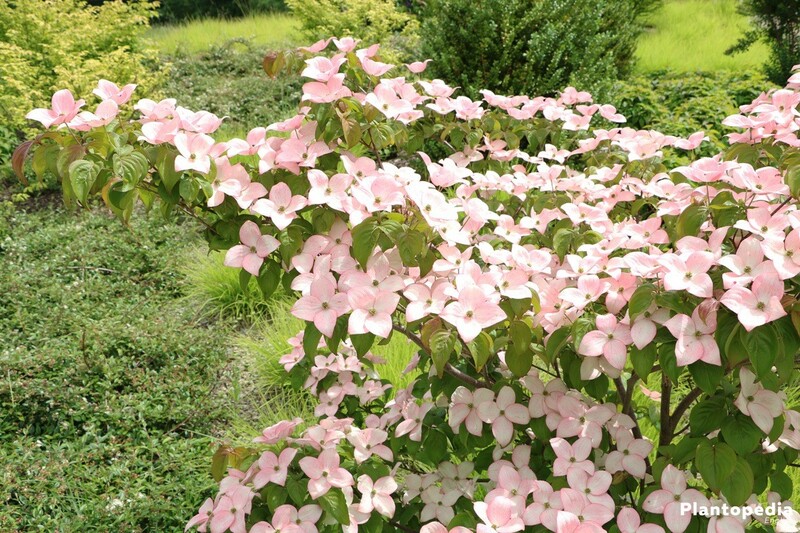 An exception is the American dogwood (cornus florida) which can only be cut in winter. All types of dogwoods can easily withstand temperatures of up to -20 °C. 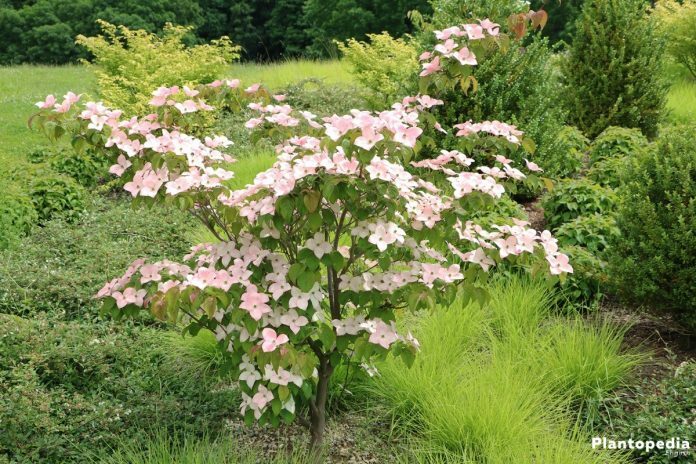 However, if you don’t want to dispense with a dogwood as a bucket plant, you have to let the plant overwinter in a cool and dry place and pour it now and then. 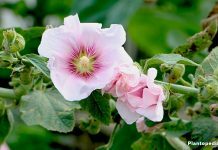 As soon as the young shrub has reached a height of about 20 cm, it can be planted out in the open. However, you should take care to avoid possible cold shocks. If you want, you can also just put the seed in the ground and see what happens. A proven and simple method is simply cutting off the young shoots that show up around the mother plant and plant them somewhere else. After that, these shoots have to be watered well, so they can root without the mother plant. 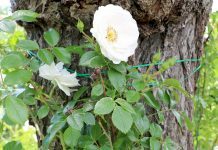 For this purpose, single long side branches of the shrub are bent to the ground and placed in the soil about 15 to 20 centimeters from the tip during early spring. It is best to weight them with a stone, so the branch won’t snap back. Perhaps provide a climbing help to the shoot tip. After 6-8 weeks, the layer should have formed roots. Simply separate it from the mother plant and plant it at a new location. In general, native species are very robust. The American dogwood and cornus kousa chinensis get occasionally infested with a fungus (anthracnose). Prevention includes keeping the soil moist and mulching it if necessary. Damage to the root ball is always to be avoided. However, a proper soil loosening is important.